Good running form happens on the roads, of course. 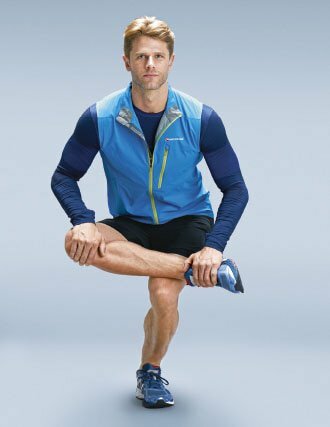 But there are simple exercises you can do before and after you run to improve body awareness, strength, and flexibility that will carry over to a smooth, efficient running stride. Try these pre- and post-run moves to make running easier. The glute muscles generate the force that enables you to run. If they are not firing properly, other muscles will pitch in. But over kilometres and kilometres, those compensating muscles can become overloaded, exhausted, and, eventually, injured. 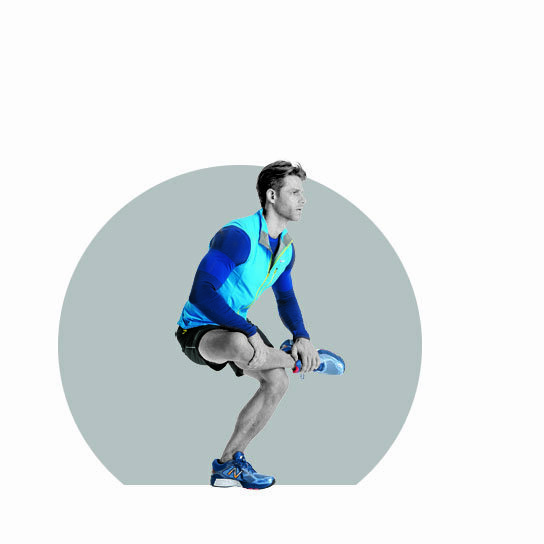 Activate your glutes by lifting one leg out to the side. ‘Draw’ soccer-ball-sized circles with that leg, feeling your glutes engage. Do 10 circles in each direction with each leg. Release tension that accumulates in your glutes by crossing one ankle above the opposite knee and sit your hips back and down until you feel a release. Hold for 10 breaths and switch sides. Good running posture is less about maintaining a stiff, rigid spine and more about pelvis positioning. When you run, your pelvis should be neutral – not tilted forward or backward – so it doesn’t interfere with the functionality of attaching muscles. Alternate be­tween lifting your chest and tailbone (left) and rounding your back and dropping your pelvis (right). Try to find a neutral point between these; that’s the pelvis position you want. 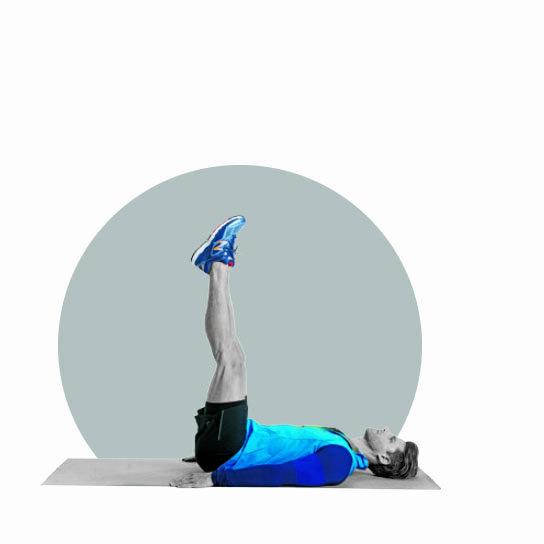 A strong core helps maintain a neutral pelvis. Lie down and lift your legs. 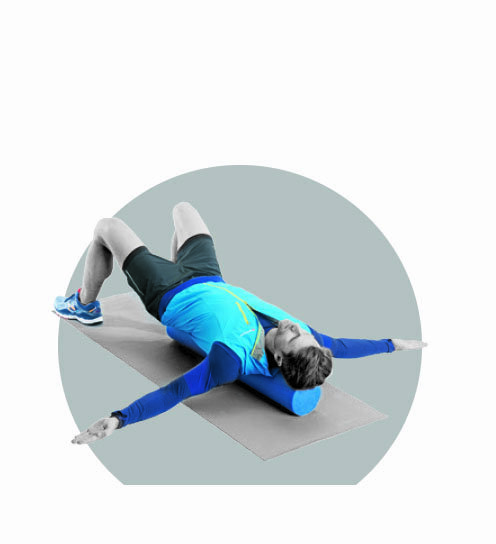 Lower your legs towards the ground while keeping your pelvis level. Bring your legs back up. Repeat 10 times. If you stretch at all, you focus largely on your legs; your upper body is probably neglected. But for a powerful running stride, your entire body needs to be working in unison. A fluid, smooth arm motion carries over to an efficient stride. 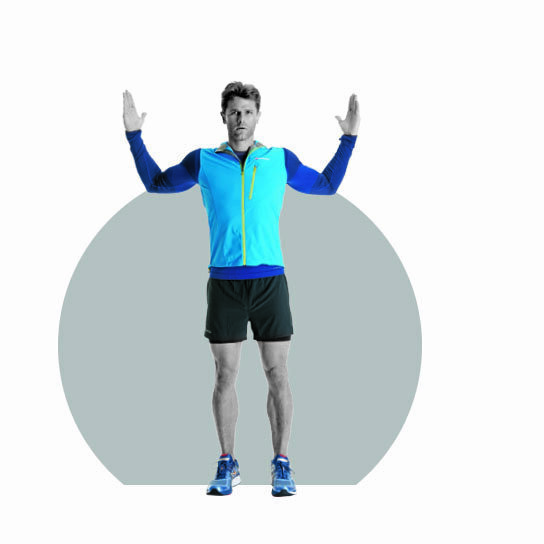 Lift your arms out to your sides, at shoulder height with your elbows bent upward. Keep your palms facing inward towards your head. Press your elbows back and lift your chest. Recline in a supported back bend over a foam roller or a rolled blanket placed vertically up your spine. Extend your arms into a T, and relax and breathe for a few minutes.